At at first glance it looks very impressive! . The rules are presented in a 136 page hard bound book (in the style of Foundry's Napoleon) and the previous experience of the author as rule writer (and as a teacher I must add!) is visible throughout. The book is very well written and the rules are clearly explained with the help of many colour schemes. Some of you would still remember the confused writing style of old wargaming rules, such the published by the Wargames Research Group. The difference, in Sam's favour, is clearly noticeable. 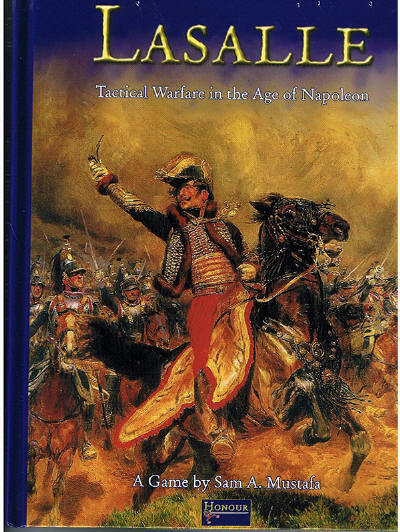 In the author's own words, Lasalle is addressed to the "Moment of battle" at small tactical level: you are a divisional (or similar) commander and you must carry out your superior commander's orders without further ado. You command a small force of 12-18 units (infantry battalions, cavalry regiments and artillery batteries). The units can be small (4 bases) or large (6 bases) , and the number of figures per base is left to the player's preference. There is not a fixed figure scale: the small infantry units represent around 500-700 men whereas large units account for around 800-1000 men. In the case of cavalry small and large units are respectively 300-500 or 500-700 men, whereas for artillery, a gun base is two historical guns and their crews. Sam gives some clues to convert existent basing systems to Lasalle, but the idea is to avoid rebasing of previous armies. All measurements are given in base widths (BW), so the only requirement is that both sides use the same basing system. No terrain scale is stated, but you can use the length of a battalion in line, as a basic measurement to deduce the extension and size of your battlefield. The player is represented by the Commander figure, and if it was allowed, an additional Sub-commander is also included with two cahracteristics, named Vigor and Tactics. The Command Range is used (10 BW for the Commander and 6 BW for the Sub-commander). However, units 'out of command' suffers only small penalizations in combat, changes or formations, Discipline tests (see below). The main effect is the impossibility of recovery and charge/countercharge movements. The Commander (i.e. the player) has not any characteristics: the Sam's approach is that you, with your inherent qualities or defects, are commanding the force. The troops are defined by Esprit in Valiant, Reliable and Shaky, and by Discipline in Experienced, Amateur and Irregular (grenzers, baskhirs, etc...). There some special characteristics: Shock, Pursuit and Lancers for cavalry and Guard for all branches of service. The guns are Foot or Horse and also Heavy, Medium or Light (with a possible howitzer designation). The Discipline is important because there are some instances under which an unit must take a Discipline Test. The allowed formations for infantry are the habitual: Line, Attack Column, Square and March Column. For cavalry are Abreast (line), Waves (column with a two-bases depth) and March column. For artillery: Limbered or Unlimbered. Skirmishers are shown as markers, small two-figure bases, used to shown the Skirmish level (0-3) of the unit, that may improve your success in a fire-fight. Terrain can be Open or Rough as well as Dry or Mud. The Cover can be Hard or Soft. Hills must be defined by the players. There is the habitual Table, covering all variations. The Moral aspect of the units is covered with the Disruption concept: when the units suffers from fatigue of battle, it acquires disruption and becomes less-able to perform and more likely to break. When an unit suffers a number of Disruptions (DISR) equals to its number of bases, it breaks and is removed from play. The units can remove disruption by Recovering. No time scale is stated. Lasalle is played in alternating turns for each player (igo, ugo) and each turn is sub-divided in four Phases, in a way somewhat different to the current habitual systems. 1) Reaction Phase (you react and shoot). Defending units take reactions. Options include a change of formation, countercharging, fall back or fire. 2) Combat Phase (you defend in combat). Resolve combats including retreats and advances. 3) Activity Phase (you move and recover units). Move units (including charging) and make recovery attempts. Movement. During the activity phase the "moving side" player selects a single force and moves each unit of that force. Movement allowances (measured in BWs) depend on unit type and formation. An infantry unit in Attack Column line, for example, has a full movement rate of 2 BWs. Changes of formations and maneuvers are addressed in a standard way, and some Troops may need to pass a previous Discipline Test. The Charge movement, i.e. the move to contact with the enemy, is also regulated. Recovery is based on Discipline tests. A die is rolled but if you unit moved, you must add another die roll, and another more if it is near the enemy. All die throwns must pass the test. You have a chance to react to the moves made by your opponent at the end of his previous turn. The possibilities are: About face, Change Formation, Countercharge, Fall back and Fire. Fire does not require a Discipline test, whereas the other reactions may need one in some occasions. Fire combat occurs during your own Reaction Phase, i.e. before you move or charge into combat. Lasalle uses a simple Kill Dice system. You roll a number of dice (one for infantry base or roundshot firing gun, or two for canister firing gun) attempting to score a 4+ on each die. Each success inflicts one hit. At the end of fire, hits are translated into Disruption markers, using the adequate table. There are modifiers in fire combat for cover or having a better Skirmish value, or for certain other situations (firing roundshot at a square for example). At long range artillery may score Bouncethrough hits. After the Reaction phase, you must to resolve combats. During your turn, your are always the "Defender". Combat. Units must be in base contact and each side rolls a number of dice attempting to score hits. If one side scores twice as many hits as the other a Decisive result has been reached. Otherwise the result is Inconclusive. The number of dice of each side may be modified depending on the situation, type of unit, formation and terrain. For example, Guard units add 2 dice whereas the units must subtract one die for each Disruption marker. Units may to halve their dice in a when flanked, etc. The sequence of combat resolution is important because a unit might be in contact with two enemy units and be forced to fall back by one before it can help fight the other. The side choosing first is decided by the throw of a die and after, the choice alternates between players. If the result is Decisive, the defender breaks and the attacker advances. Otherwise the loser falls back. If the attacker has won he must advance (defenders never advance even if they win). The combat loser takes 1 DISR (and may break, being removed for play). Winning cavalry also takes 1 DISR for each won combat except when if doing so would break it. The Game Basic Length for Competition games is 16 turns (8 for each player), and it will be fixed for historical scenarios. Bonus Turns may be added by throwing dice (a reminiscence of Grande Armee, the first Sam's ruleset). The Army Morale level is calculated by adding up all the units of the army: Large Infantry and Cavalry count 3 points each, Small Infantry and Cavalry 2 points each, and Artillery 1 point per unit. The Army's Breakpoint is reached when the moral point value of its broken units (calculated as above) is greater than one-third of the Army Morale level. In that case, you must pass a Morale Check with five dice, whose total roll must be greater than the current turn number. The rules about towns (or built-up-areas in NB jargon) are presented in a single chapter. A town base represents an area large enough for one unit (a small hamlet or a chateau) so large towns and cities can be shown be arranging several bases in a grid-fashion. The town bases can be individually fought by the two sides. As well as a section about the 'Set up of a game' including weather, a set of pre-designed boards (or tables) customizable by adding terrain items and objectives, and the arrival of reinforcements. The next Section is the Army Builder. This system allows to create balanced forces for each of the six major powers (Austria, Great Britain, France, Prussia, Russia and Spain) in different theaters and periods. For example France is given list for Conquest (1805-1807), Empire (1808-1812), Peninsular (1808-1813), Liberation (1813-1814) and The Hundred Days (1815). There are also lists for Minor and Other States: Bavaria, Brunswick, Confederation of the Rhine, Denmark, Holland and Dutch-Belgian. Kingdom of Italy, Naples, Portugal, Saxony, The Duchy of Warsaw, Westphalia, Württemberg, The Ottoman Empire and Sweden. The book is finished with a F.A.Q. section and the Tables or Quick Reference Sheets. Ya can also look at two reviews of Lasalle. The first one is from Mark Severin's Deep Fried Happy Mice site and the other was posted by David Brown in The Miniatures Page site. According to the last news, Lasalle will be translated into Spanish (La Armada) . The planned publication date will be the first months of 2010. Following the best tradition of Sam's rulesets, the HONOUR web site is full of items, including a Forum and a Wiki section devoted to the design of Scenarios, so it is worth to visit it. Summarizing, Lasalle looks like a very good ruleset for small tactical confrontations at divisional level. You have your orders from your Commander-in-Chief and you must to obey. No grand-tactical subtleties are allowed: the force on the hill-line at your front must be defeated or your must defend the town at your left, until the last consequences. The defeat of the enemy is the only thing to be considered, so combat becomes the focal point of the action. Evidently, some things must be simplified and abstracted to allow greater playability, but this occurs, in a way or another, in all the wargaming rulesets.